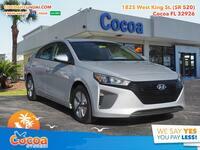 We’re all about eco-friendly vehicles here at Cocoa Hyundai, and with the 2017 Hyundai Ioniq Hybrid you’re not just getting a better alternative, you’re getting a better car. With it’s thoughtful amenities, advanced safety features and an ingenious design, the future of hybrids is here. Even though the 2017 Ioniq Hybrid is ahead of its time, safety is still the highest priority. Especially in cars, the importance of feeling safe in your surroundings cannot be explained. When it comes to safety, the 2017 Hyundai Ioniq Hybrid offers some of the industry’s most popular and innovative features available. With its available Automatic Emergency Braking with Pedestrian Detection System, your 2017 Hyundai Ioniq Hybrid will sense vehicles and pedestrians that are in front of your car, and will start to brake automatically for not only your safety, but the safety of everyone around you as well. In today’s world, cars and technology go hand-in-hand and the 2017 Hyundai Ioniq is no different. While other vehicles have USB ports for you to plug in the charger for your phone, the Hyundai Ioniq offers the ease and convenience of charging your smartphone or tablet wirelessly. The Hyundai Ioniq Hybrid’s 26.5 cubic feet of cargo space is out of this world. In addition to that, there’s a large hatch that gives you better access for loading and unloading your trunk. With its 60/40 split-folding rear seatbacks, nothing will be too big for you to haul in your 2017 Hyundai Ioniq. If you ever share your 2017 Hyundai Ioniq with another driver and they adjust your seat and mirrors, save the time and hassle of getting everything exactly the way you want it with the available Integrated Memory Driver Seat on the 2017 Hyundai Ioniq. By simply pressing a button, your seat will move back to your preferred position. Also, with the MyHyundai with Blue Link® App, additional security and peace of mind can be accessed from your smartphone, smartwatch, a web application, or the in-car system. Keep yourself informed on your Hyundai Ioniq’s health or even call for help. If you do ever end up in an accident, your Hyundai Ioniq can send an automatic collision notification and request assistance for you. 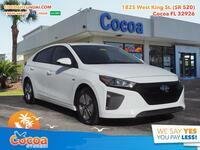 If you’re looking for the latest in Hybrid-car technology, look no further than the 2017 Hyundai Ioniq which you can find here at Cocoa Hyundai in Cocoa, FL. Schedule a test drive with us and get one step closer to owning your new 2017 Hyundai Ioniq Hybrid. 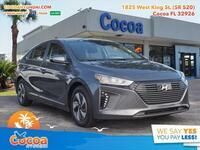 Interested in a 2017 Hyundai Ioniq?